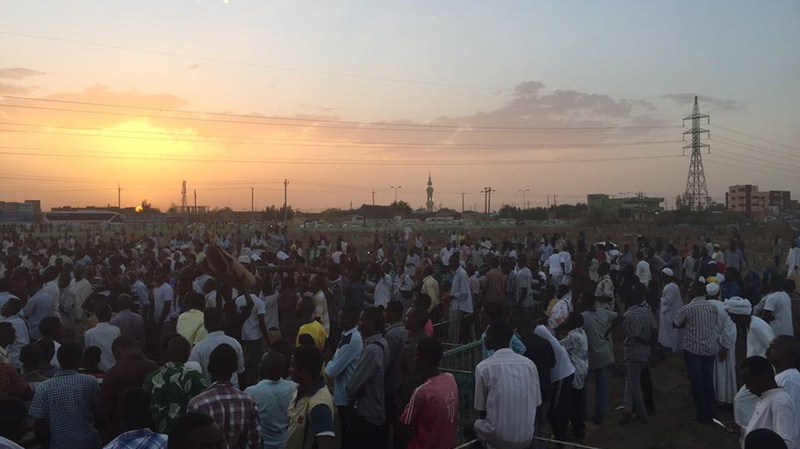 “The death of a student is the death of a nation,” an ever-growing crowd of protesters chanted as they marched towards Hamed Al-Neel Cemetary in Omdurman, Sudan’s economic capital northwest of Khartoum. The crowd, reaching thousands in number, were protesting the killing of another university student – the second in just over a week by security forces. Security forces shot dead 20 year-old Omdurman Ahlia University student Mohammed Al Sadiq, nicknamed “Timbesh,” just outside the gates of the university April 27 around noon. Al Sadiq, a member of the Nuba Mountains Student Union, had participated in a forum on campus to discuss an attack last week by ruling party students against a blind student and Nuba Mountains student union member, Badawi Suleiman. Pro-government students and security agents violently disrupted the discussion, forcing the participants to move outside the university premises and shot Al-Sadiq, eyewitnesses told Nuba Reports. According to a medical report seen by Nuba Reports, Al Sadiq was shot in the left side of the chest near his heart. The attack in Omdurman comes just nine days after security agents and pro-government students shot dead another student. On April 19, security and affiliated students killed 19-year-old student Abubakar Al-Sideeq and injured roughly 40 students at the University of Kordofan in North Kordofan State, eyewitnesses told Nuba Reports. At least 15 of these students are suffering serious injuries, according to human rights reports. One eyewitness told Nuba Reports security agents attacked them with batons and live ammunition, temporarily detaining 12 of the students. The attack took place while students affiliated with the opposition attempted to submit their list of student union leader candidates ahead of union elections, local sources and news reports said. Just a week earlier, ongoing protests starting April 13 took place at the University of Khartoum in the capital over a proposal to sell the historic university land to an investor and relocate the institution to the outskirts of Khartoum. On April 18 and 23, security forces and police dispersed and detained several students during two major protests, demanding a clear answer from the administration regarding the potential relocation of the university. The Council of Ministers spokesman, Dr. Omer Mohamed, denied there are plans to move the institution. The killing of two students and the possible relocation of Sudan’s oldest university have triggered student protests at eight universities across the nation, including an ongoing sit-in organized at Red Sea University, Port Sudan State. Student protests played a key role in both the 1964 and 1985 revolutions in Sudan. History potentially explains the violent crackdown by authorities whereby security forces have armed pro-government student groups, students participating in the Omdurman protest said.